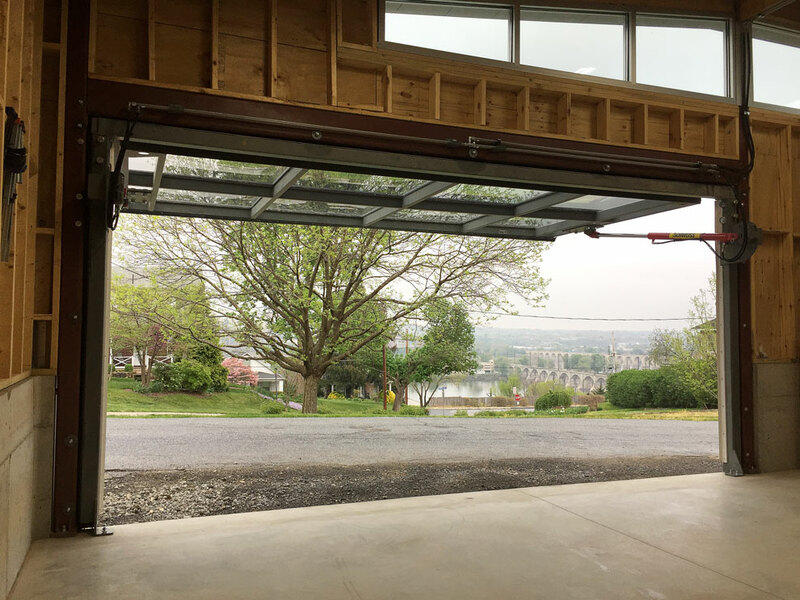 Brian Tavares, an electrical engineer from Lemoyne, PA, loves the wide open look of his Schweiss 17' 6" x 8'2" hydraulic door and the view it gives him from his garage and workshop. It's very satisfying for a business to hear from a client who mentions sincerely that he or she was equally satisfied with the service rendered as well as the product itself. 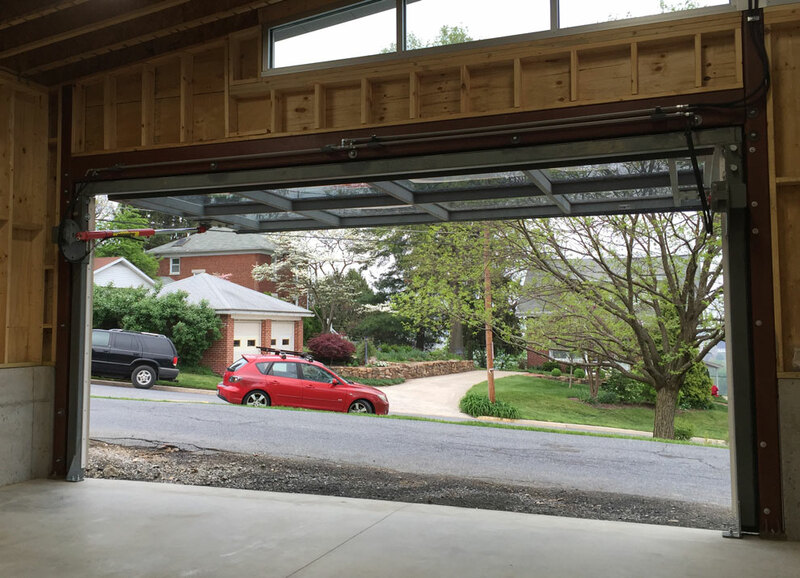 It's also been a highlight for Brian Tavares of Lemoyne, PA who says one of the best things about his new Schweiss hydraulic garage door is hearing favorable comments from people who see it. "I like the reaction from people,"" said Tavares. "When they drive by, see it open or come to look at it, they love the look and want to know how it functions. People really get a kick out of the fact that you went the extra mile to do something different in a residential community." “Thank you and everyone at Schweiss for the door I finally have installed and working. The build quality is top notch and the installation instructions were very easy to follow. The driver who delivered the door was very accommodating and a super nice guy. Everyone who walks by the garage asks about the door. It makes the building stand out, especially when it is fully open. There were a lot of ups and downs on this project and Schweiss was excellent to deal with through the entire process. I wish everyone I dealt with on this project was as easy to deal with as Schweiss was,” said Tavares. His new 24'x24 garage replaced an old carriage house. With large hydraulic door windows and additional windows above the garage it lets in available natural light throughout the day. Large 4'x4' 1/4" thick polycarbonate tinted gray Lexan window panels really add to the look of the door. 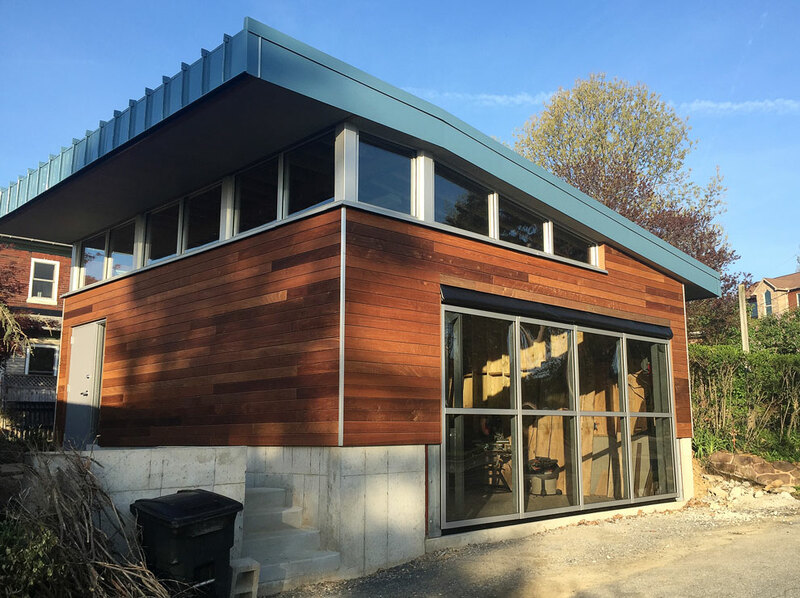 Not only that, they are functional and lighter weight than glass; letting you look in or out at for a great view, but they also bring a wealth of available daylight into the garage. As far as the "ups and downs" he mentioned above, those dealt with the construction of the building itself, not the door. After ordering the door he had to fire the builder and start over again, which resulted in a three-month delay. Schweiss dealt with the delay accordingly. "Even though the door was ready to ship, Schweiss was great about it and said they would check back again next month. They were very accommodating, not pushy or anything and just told me to let them know when I was ready. When the driver called and arrived promptly with the door at 2 p.m., like he said he would, he helped me unload everything. It was great," said Tavares. Tavares said he bought a 1926 Craftsman house in Lemoyne that had an old decrepit carriage house on it that was being used as a garage. Tavares recalls being first introduced to Schweiss doors in the "Must See Photos" section of the Schweiss web page. The hydraulic doors, he said "Were the ticket" in order to have the extra overhead space in the garage. 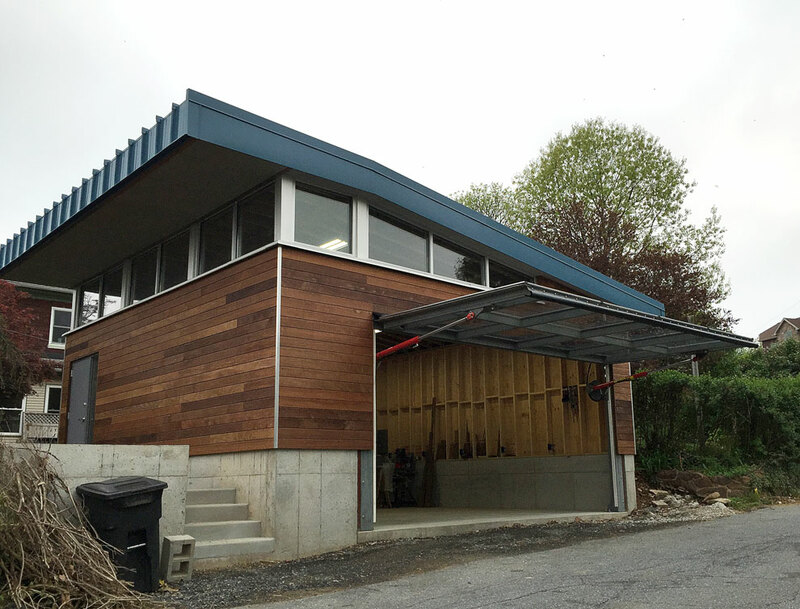 "I hired a local architect, Chris Dawson, from Harrisburg to design a new garage. He had the idea, originally to use a bifold door. He showed me somebody's garage that had three or four bifold doors from Schweiss on it. I started researching the bifold doors and then hydraulic doors on the Internet; Schweiss kept coming up time and time again. "I ended up going with the hydraulic doors because they have less mechanical stuff to make it function. I liked the big canopy. 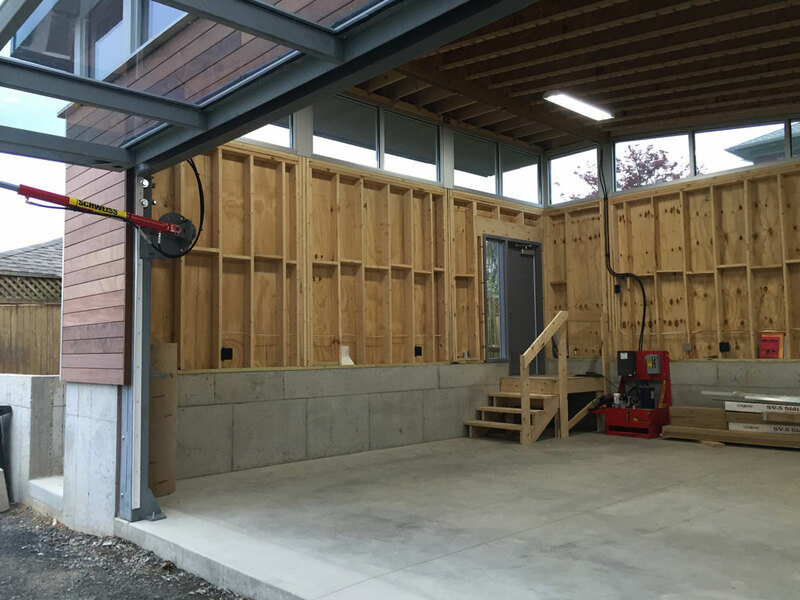 We tore down the carriage house and started from scratch and built a 24' x 24' garage. Its primary usages will be as a woodworking and metal shop for me. I'm an electrical engineer by trade," explained Tavares. 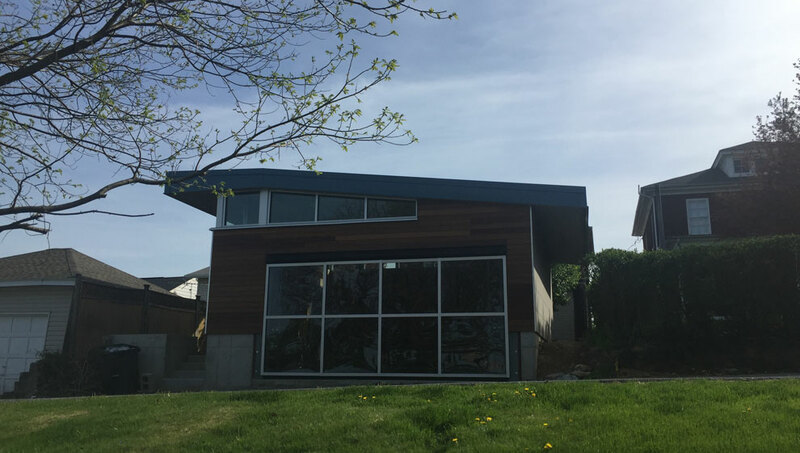 Architect Chris Dawson came up with the entire garage design including upper windows on the garage itself that extend to the 15' roof height. This was planned not only for an aesthetically pleasing look, but also so Tavares would have enough room in the future for a lift. The windows also let in additional light year-round. "The Schweiss hydraulic power unit stands out from other companies. The backup options from Schweiss are very nice - I got the battery backup. I mounted the power unit at the back of the garage right next to the stairs so it would be out of the way," said Tavares. "The hydraulic door from another company was double the price from the one Schweiss makes and their power unit looked like it came from a car lift. The competitors power units were not nearly as robust as the Schweiss unit." "The door is fantastic, there is nothing wrong with any part of it. It was very easy to install," said Tavares. "I like the fact that it is overbuilt. I'm sure the steel probably could have been thinner and the power unit probably could have been a little bit less powerful, but what you get for the price, if I had more projects I would put them on everything. As a comparison, for what I paid for the door, an 18' x 8' rollup aluminum glass door was more money than the hydraulic door. The big thing is, because I had so much extra space, that space would be gone with all the crap hanging there. Why would I buy a rollup door?" Tavares chose to place his hydraulic pump at the back of his garage. He equipped it with a battery backup system to use in case of a power outage. The pump, he said, was far superior to others he looked into. People passing by on the street are enamored by the classic look of Tavares residential garage and door. His greatest satisfaction is hearing from these people. Tavares chose the Schweiss hydraulic door over the bifold door because it has less moving parts, gives him optimum headroom and provides him with a nice canopy when open. He installed it himself. 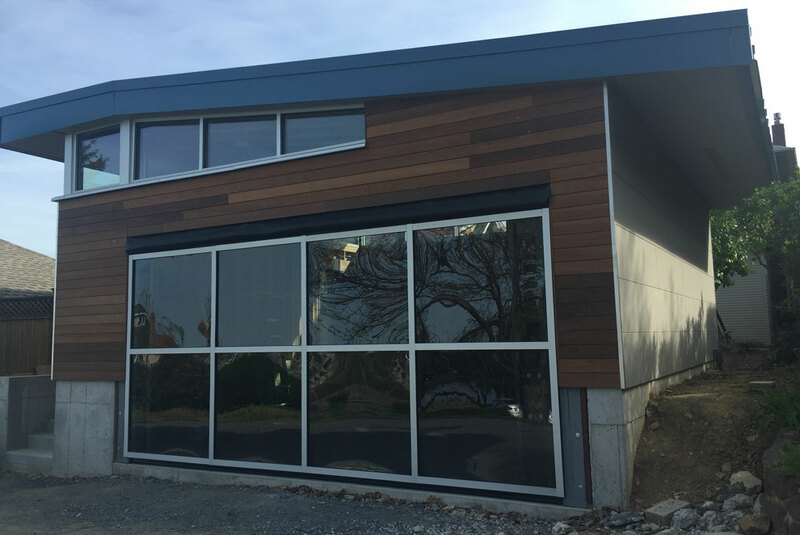 The eight 4'x4' Lexan windows have a gray tint visible from the outside but clear from the inside. He chose Lexan over glass because it is lighter in weight. His contractor provided him with a strong steel frame to support the door. When he opened the door for the first time, to his amazement, he said the building didn't creak whatsoever. 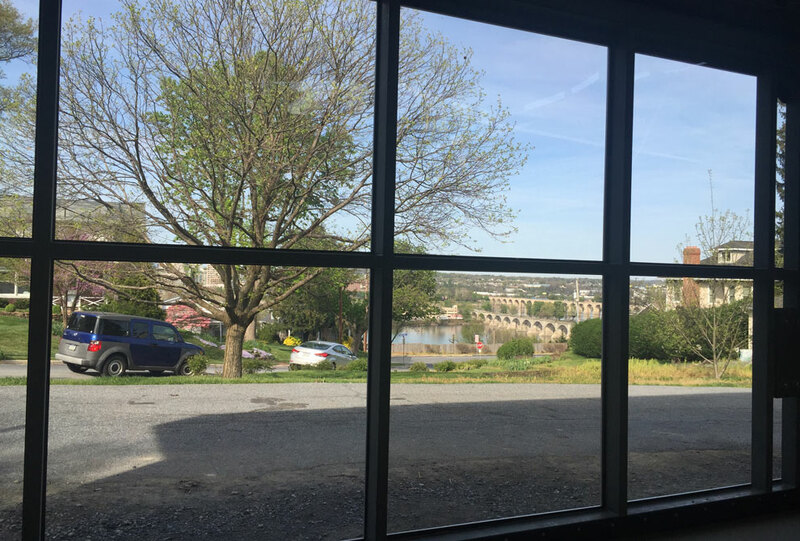 Looking out his closed garage door, the large 4' Lexan windows still provide a beautiful view of the banks of the Susquehanna River and Harrisburg, the state capitol.